Original picture that he drew.. 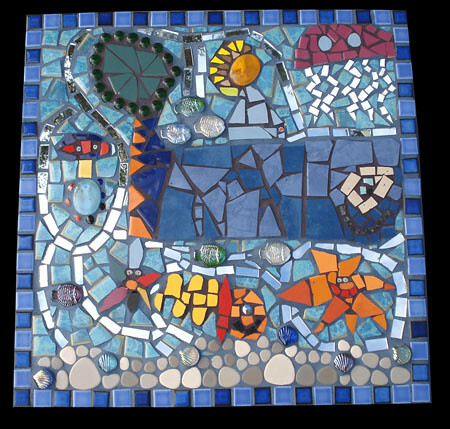 Final mosaic that he called Waterworld 🙂 He always comes up with groovy names for his pieces… Next up for him is a giraffe that I think we will put up on the house this time… in their secret hideout! Jane started making mosaics five years ago. Something about the freedom in the art form attracted her. In the eyes of a beginner, it appeared as if there was no “wrong” way to approach mosaics. Her opinions have since changed – now when she sees a mosaic artwork she marvels at how much thought has gone into the placing of each tiny piece. Movement and contrast are the two aspects Jane aims to incorporate within her work. Creating “movement” is somewhat contradictory when glass and ceramic tiles are unwieldy by nature. And yet, this is the challenge! Presently, however, Jane’s main focus is on being a mum while also completing a degree in Arts History at Queensland University. It’s a wonderful balance for her to mosaic after studying all day – getting away from being theoretical about art, and into a practical understanding of it. 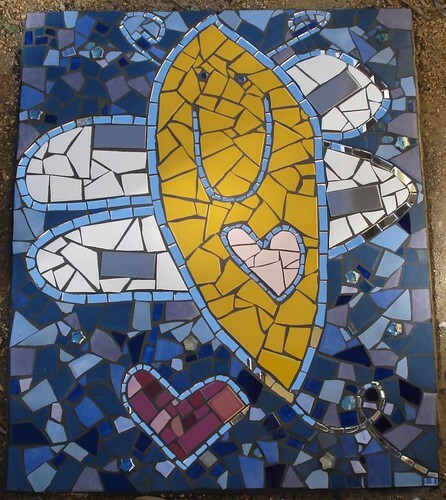 A love for learning has led Jane to doing several mosaic courses. The first course was with Scott Harrower – who is now President of the Mosaic Association of Australia & New Zealand (MAANZ). Her mosaic interests have also led her to travel to Italy and study under Martin Cheek. It was Cheek’s course that introduced her to Italian smalti and millefiori, both of which are used in her most recent mosaics. In the future Jane would like to continue the trend of mixing travel and mosaics. Istanbul, with its wonderful Byzantine mosaics, is next on the list! And I think I won’t be too far behind! Only one example of her many fantastic stepping stones. I believe she does them all reverse indirect. This time we’re doing it on mesh. Much easier than the reverse indirect! 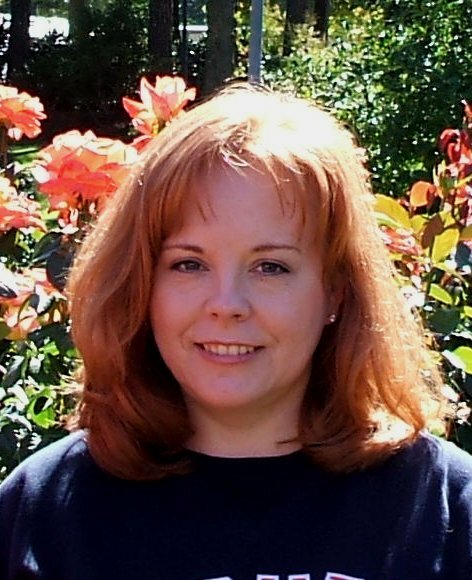 To add to the Artist Watch Series, meet Susan Walden aka BamaSusanna on Flickr. 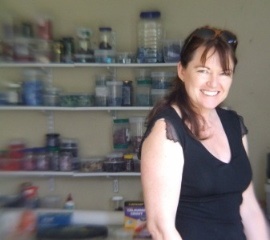 Susan lives in North Carolina, USA and has been making mosaics for around 15 years. I also met Susan through Flickr. It’s become a huge playing field for mosaicists aswell as other artists and of course photographers and it’s been alot of fun getting to know artists from around the World. I found Susan thanks to Donna over at her blog Make Mine Mosaics. Donna blogged Susan’s birdbath. I immediately responded to her work – it’s amazing! Susan started in mosaics as a result of having so many scraps from making stained glass, a craft she taught herself from reading library books. 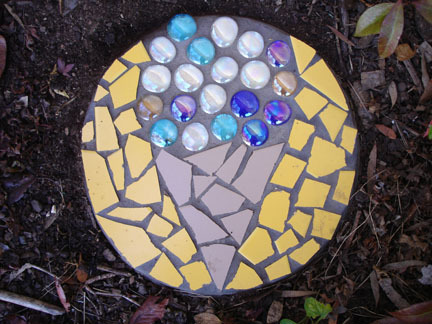 Inspired from seeing mosaic stepping stones and learning the basics of mosaics from information found on the web, Susan decided to give mosaic a go. To begin with all she made were stepping stones and must have made a hundred of them! Working in a custom framing store, she sold quite a few through the shop. 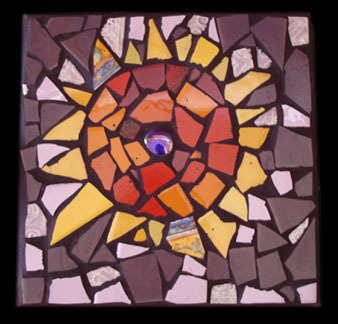 Susan made nothing but stepping stones until about a year ago when she discovered a wonderful stained glass and mosaics forum on the internet. The forum was full of friendly artists who were very encouraging and it was from there that she was introduced to other mosaic artists’ websites. She browsed a lot of different styles and counts Irina Charny and Laurel Skye amongst her favourite artists (don’t we all!!!?) as she loves their use of colour. 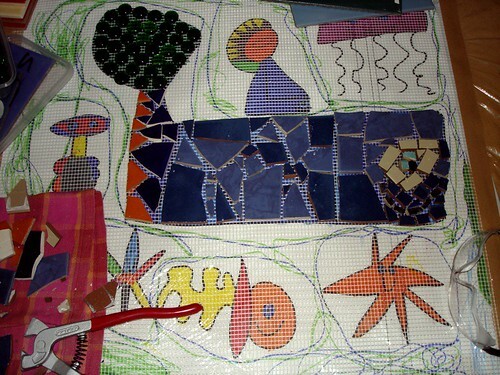 The art that Susan’s newfound web buddies were turning out inspired her to try out different bases for her mosaic. The first 3D piece she made was a chimney. Covering the whole thing with scrap glass and finding a ceramic platter that worked for the top transformed it into a fantastic (and recycled) birdbath! After the positive feedback received from that piece, she was encouraged to go on and try other things. Susan made another birdbath, this time using a concrete base. She cut glass squares for about a week before even starting and had no particular design in mind. She just picked up a piece of glass and got started, choosing colours as she went. It tuned out to be her favourite piece, and definitely one of mine aswell! 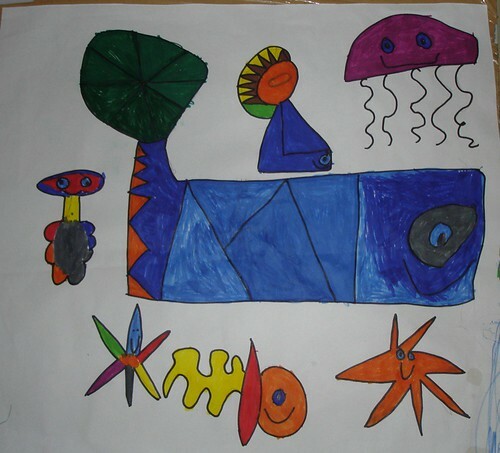 From then on, she hasn’t been afraid to try anything creating mirrors and other art pieces (watering can included! ), all with encouragement from her friends. She is now a proud member of SAMA. 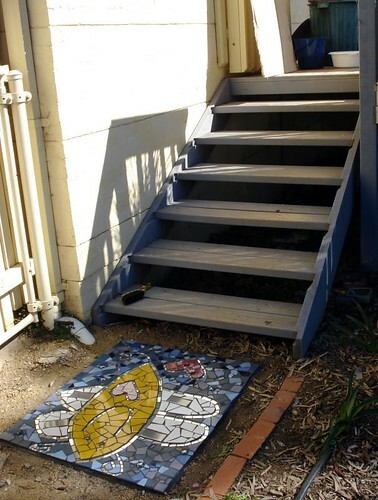 We made this with ceramic tile that we had on hand, smashed with a tile hammer. 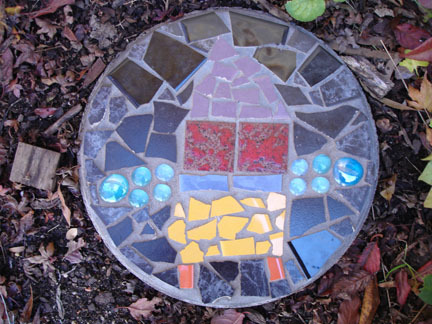 The kids love to do mosaics like this. It’s exciting to break things as a youngster I think (as an adult too…) but also kids like instant gratification and working like this is exactly that. I love the grout – a product by Custom Building Products. It was leftover of some I bought in the US last year. It is such a wonder to use. So easy to work with. We don’t have it here in Australia, of course. They also come in fantastic colours. The lads at the shop where I buy my supplies think I’m a nut when I start talking about all the things I’m looking for. Though they’re lovely and very helpful. I have thought of perhaps distributing it here, but it would be a whole other branch of business… Don’t know if I’m up for that yet, but we’ll see. More Mosaic Made by Kids! These are all old now: my boys made them at the ages of 4 and 2, but they are still in the garden (by the entrance to the secret hideout) and still intact! Both the boys made the whole thing themselves. I helped Liam with drawing the icecream cone, but it was his concept and he chose all the colours and mostly lay the tile himself (he was only 2!!!). Rory made his entire stepping stone himself from start to finish! They used all broken ceramic tile that they laid directly onto the stepping stone. Made in 2005.